This instalment of our Ride25 training guide will focus on creating a sensible training schedule to help achieve your goals. If you need a hand setting goals check out our New Year’s Resolutions post, or for help mapping rides check out part 2 of our training guide. I mentioned in part 2 that to achieve my goal of staying on the saddle all the way up Nufenen Pass, I’d develop a training routine consisting of “incrementally long and hilly rides starting at 50 miles and working up to 120 miles” – after this guide you’ll have the tools you need to set yourself a similar, tailored program. The longest day of the Ride25 ride I’ll be doing is 97 miles, and Nufenen Pass (my white whale) has an elevation of around 3710 feet over a distance of 8.4 miles (measured from the nearby village of Ulrichen to the summit). That means an average elevation of 442ft per mile. 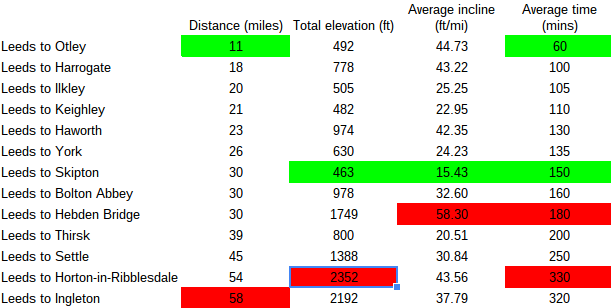 I want to ensure that I’ve done training rides with similarly challenging distances and elevations at some point in the training regime to make sure I don’t get caught short on the tour. 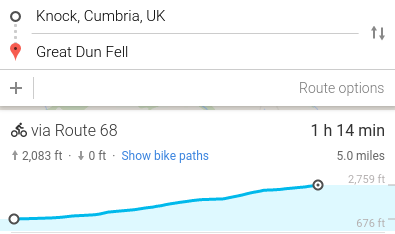 This considered, I need a few rides over 100 miles long and a hill with a similar elevation profile to Nufenen; the latter is tricky because there aren’t any in the UK! There are plenty of steep hills that are too short or long hills that are too shallow, but the closest I’ve been able to find is Great Dun Fell (GDF), up in Cumbria, which has an elevation of 2080 feet over a distance of 5 miles. Cycling up GDF, down it, then back up is about the closest I’ll be able to get to the Nufenen Pass. The map below is from the previous instalment, and shows all the main locations my training rides will go to / from / between. Hopefully this will help you put together your very own training schedule. Let us know in the comments if you have any questions.